This design is the result of an awful lot of time after final deadlines and a fair bit of experimentation. This does take time and patience, so be prepared! But this is possibly my favourite design so far. The initial base coat, one layer. I used a plain white for one coat to strengthen the colours that would be put on top. 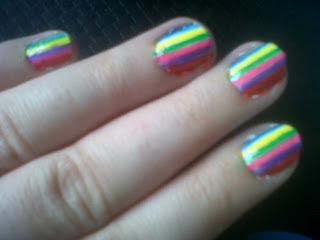 After drying, I used stripers to apply thin vertical stripes of various colours along each nail. Once these had dried I then reapplied for a second coat. After waiting a little longer than usual to ensure the stripes were completely dry (this is very important), I cut lots of thin strips of ordinary sellotape to use as a stencil. I stuck these to fabric before applying to my nails to reduce the adhesive and prevent the tape taking off any of the existing nail polish. 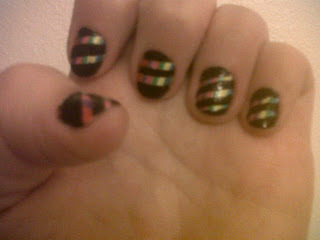 I then stuck these to my nails at diagonal angles, making sure they were stuck right up the edges of each nail. I decided on two strips for each nail, although you can see by the picture that I experimented with three for one nail. Using a plain black I then applied two coats to each nail, making sure the black was a solid colour, with no visible brush strokes or rainbow colours. After waiting for these to completely dry, I gently peeled the tape off. With any uneven lines, I used a black nail pen to straighten them up and thicken any that seemed too thin. Once dry, I finished with a double top coat of clear. As I said, this is quite time consuming and fiddly, but if you’ve got a bit of spare time give it a go and experiment a bit with it! There are nail art stencils out there that can be used just as well, but to be honest sellotape is cheaper, more easily accessed and I found it works just as well. There’s so many different things you can do with this technique, I’m excited to try out some different ideas!